The energy renovation of buildings can meet the increased electricity demand from electric vehicles. The world’s greatest potential is waiting to be unleashed. It can help us get our planet back on track and to achieve the Paris Agreement – keeping the global temperature rise well below 2°C. It is all about doing more with less. Our greatest energy source is the energy we do not use. Energy efficiency is the one resource that every country possesses in abundance and it is the quickest and least costly way of addressing energy security, environmental and economic challenges. We have a climate-friendly, trillion-dollar opportunity waiting to be unlocked. Unfortunately, we see that global energy efficiency is slowing down while growth in overall energy demand intensifies. Urbanization across the globe puts our available resources under pressure and we need to carefully plan to ensure that we have enough resources for the world’s expanding population. We cannot overcome these global challenges without an increased focus on energy efficiency. Energy efficiency is not a question of technology. It is a question of mindset, smart thinking, governance and cost-effective solutions. The solutions exist and can be adopted immediately. Next year, Danfoss will use half the amount of energy to generate the same output as we did when I first joined the company, a bit over a decade ago. This is not just good business, it is common sense. We often speak about the costs of energy efficiency. This is conceptually wrong. We should focus on the return on investment, and yes, there is enough evidence that energy efficiency does pay back. On average, every €1 invested in energy efficiency saves €3 over the lifespan of a technology. We need to assess the potential of energy efficiency in all investment decisions. This means making informed choices and ensuring that governments are investing taxpayer’s money in the most cost-effective way. To really get the world back on track we need a connected energy system, with energy efficiency as the central pillar, supported by renewable energy, sustainable buildings and electric vehicles. We also know that renewable energy sources are picking up; and yet, one of the most fundamental challenges is that green energy is not produced when and where we need it. That means we need to store or transport it. Without efficiency, the potential of renewables alone for a clean energy transition cannot be fully unlocked. Together renewable energy and energy efficiency can bring more than 90% of the energy-related CO2 emissions reductions needed to meet the targets in the Paris Agreement. The large-scale deployment of electric vehicles will increase the electricity demand. A demand we can meet with our buildings. The accelerated energy renovation of buildings can ensure that the energy grid has sufficient capacity to sustain the world going electric. 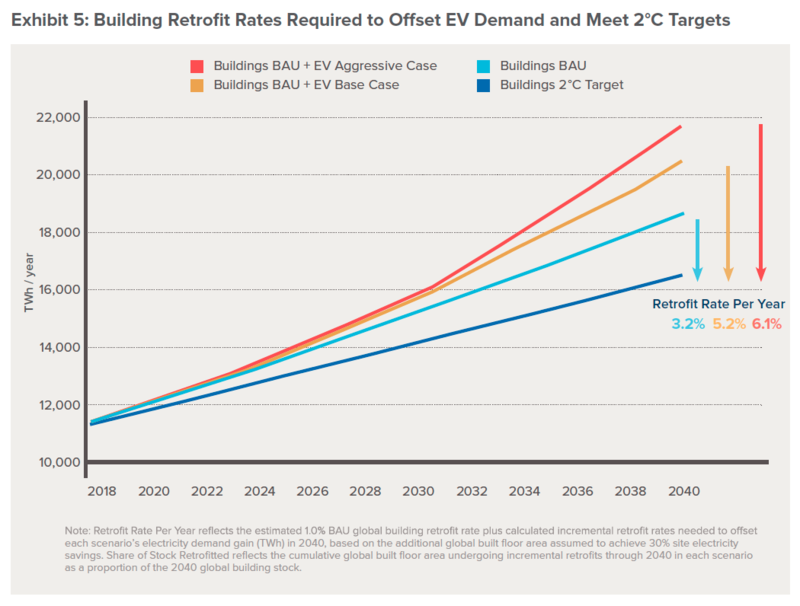 By increasing the building retrofit rate from approximately 1% per year to 5% per year, it is possible to power 550 million electric vehicles on the road by 2040 – without the need to increase generation capacity. In Copenhagen, Denmark, Scandinavia’s largest urban development project is rapidly becoming a district of 40,000 residents and 40,000 workplaces. It shows how electricity and heating, energy-efficient buildings and electric transport can be integrated into an intelligent, flexible and optimized energy system based on a large share of renewable energy. EnergyLab Nordhavn is a key part in reaching Copenhagen’s overall goal of being CO2 neutral by 2025. This is possible because energy efficiency is the key and has been for decades in Denmark. In the past 40 years, energy consumption in Danish buildings has been reduced by 45% per square metre. As Greater Copenhagen accounts for 40% of Denmark’s population, solutions in Copenhagen like EnergyLab Nordhavn will contribute substantially to the national targets. This could be done in other cities, in other countries. ⦁ We can reduce the final energy demand in buildings by 30% just by optimizing control of energy flows, with investments that are paid back within two to five years. ⦁ We can make the water sector energy neutral, saving the equivalent of 4% of global electricity consumption, with investments that will be paid back within five years. ⦁ We can recover excess heat via district heating networks or local space heating. Excess heat can be industrial process heat, or waste heat coming from a supermarket or a data centre. Just in Europe, we could supply the equivalent of the total demand for energy in buildings via excess heat recovery. ⦁ We can replace 10 conventional coal-fired power plants by connecting the capacity of all supermarkets’ refrigeration systems to the grid, in Europe alone. The stories are endless. Digitalization will help us speed up and exploit new areas of efficiencies, such as sector coupling or demand-side management. We operate in a world challenged by a growing population, booming urbanization and clear issues related to climate change, and energy efficiency is our best tool to mitigate the challenges. And it is in our own hands. It is possible to turn down energy consumption and turn up growth. Energy efficiency could deliver significant economic, social and environmental benefits but only if all of us, including governments, take bolder action. We are ready with the technologies and solutions. And by implementing energy efficient opportunities available today, we could lower energy-related greenhouse gas emissions by 12% before 2040. Now that would be a big step to get the world back on track.